really appreciate the effort you are putting in here! Do the 1157-R26-CBT bulbs still trigger the STOP LAMP light with the small extra resistance meant for canbus? Or would you sill need to add resistors if you didn't want to pull the dash light bulb? The reason i havent taken the dive with LED lights + resistors is because it seems to me that if you try to be more efficient with the LED's, and have them turn on quickly, putting a resistor in there would take it back to the exact function of a normal bulb - slow turn on time and high resistance (power drain). Wouldn't the resistor negate everything about the LED (Perhaps except the brightness)? LEDs still come on quickly with a resistor, but yes there is a power drain that you wouldn't have without a resistor. If I ever do LEDs I'll see if I can omit the resistors. I will verify this to be absolutely certain but I am pretty sure it will still trigger the STOP LAMP. I will post later with the results. If you just want to dip your toes into trying LEDs I suggest you do the side markers first. They don't require a load resistor so you get all the advantages. Both of my cars needed a little cleanup of the side marker sockets. I had a couple of bulbs that I thought were burned out but it was corrosion on the contacts. I just sprayed with contact cleaner and inserted the bulb a few times to clean it up. If you happen to like the appearance of clear side marker lenses this would be a perfect time to switch to LED's. To summarize there is really no downside except expense. Remove the STOP LAMP idiot light from the dash and you can do the brakes and side markers today. The big one for me was the backup lights! I always thought the backup lights were wimpy. The 1157-W26-CBT bulbs are fantastic as backup lamps. The turn signals are another matter. You get the hyperblink when you change them for LEDs without the load resistor. When I get some other projects done I will see if I can find a pin compatible replacement flasher. So far I have only changed the front turn signals for LED's and installed the load resistors. This was strictly to save the amps at night. Perfectly well good sir. Adding this to the list of upgrades. Thanks for your research and sharing of knowledge! I did the CAN LED test today. 1157-R26-CBT still needs a load resistor. I wish it was not so. Another update. I bought one of the 1157-R26-CBT bulbs. I put it in the car to compare and took some photos. In the tail light photos the right bulb is the 1157-R45-T. All the photos were taken with the camera on manual and the same settings. The brightness difference between the bulbs is obvious with the naked eye. It is quite less obvious in the photos. The relative brightness is that the filament bulb is quite a bit less bright. The R45 bulb is second and the R26 bulb is brightest but not by much. That agrees with the vendors ratings as well so save the $5 and get the R26 bulb as it is the brightest anyway. Photo 1 is obviously the three bulbs. The left one is your typical 1157. The middle is the 1157-R45-T and the right bulb is the 1157-R26-CBT. Photo 2 is running lights with the left bulb the filament 1157. Photo 3 is with the Brake pedal depressed with the left bulb the filament 1157. Photo 4 is the running lights with the left bulb the 1157-R26-CBT. Photo 5 is with the Brake pedal depressed with the left bulb the 1157-R26-CBT. The R26 is taller, though. It may be that the light housing likes its output pattern better. Still going to try the $8 ones. They sport 60/20 lumens. I'll see if that's enough, or at least comparable to the incandescent. Probably OK for the turn signals, at least. That's good to know. Thanks for taking the time to do that! I know what they rate it lumens wise but the R26 is brighter both ways. It may be the way the lumens are measured as well or like you say it matches the housing better. It will be interesting to hear what you think of the $8 one. Could be a better option for most people. And as I have mentioned before the front turn signals benefit from the power savings at night. The rear turn signal bulbs are 1156 and I wouldn't bother putting in LED's there unless you are going to the clear housings. You use the signals so little there is no appreciable power savings from changing to LED's. This is just one of those silly things that I had to look up - according to the available sources the 1157 filament bulb is rated at 402/38 lumens. So probably close to 440 lm with both elements on. The red LED's only put out light in a very narrow spectrum. In the case of the red LED bulbs almost all the light passes the red filter in the tail light assembly. In the case of the 1157 filament bulb only about 10% of the light makes it through the red filter. That is why the LED bulbs are brighter even though the lumen rating is lower. In the case of the backup lamp the LED bulbs are rated 490 lm for the CW26 and 220 lm for the CW45. The CW26 is quite a lot brighter than an 1156 filament bulb. I didn't buy a CW45 because I doubted it would be brighter than the 1156. When you start adding in colored filters you can no longer do a direct comparison with lumens. The other thing that can mess up the comparison is the fact that LED's are directional in nature so the housing makes a huge difference in the apparent brightness. Right. Light measurement has a lot of fudge factor - where in the spectrum the measurement is made, on-axis/off-axis, colored filters, like you say. And there doesn't seem to be any sort of guidelines or parameters, or at least no one mentions them. Often the LEDs are perceived as brighter despite the measurements, quite possibly because the measurements are biased toward white light. SuperBrightLEDs.com offers a flasher that is compatible with LED's. 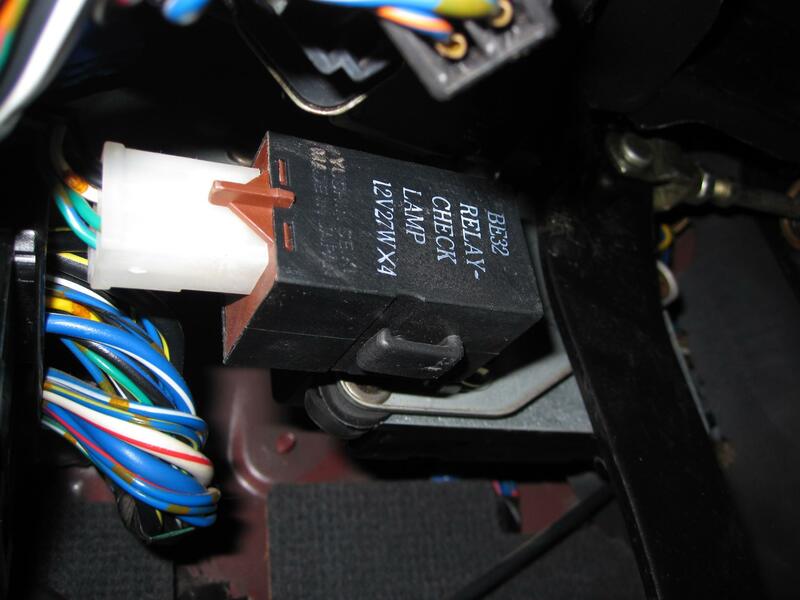 For the '79 SA (possibly the '80), you will have to make a "pigtail" jumper/adaptor from the under dash connecter to the new flasher. Hint: Use a H-4 headlight plug SOCKET for one end. To remove the old reflecters, heat up the nose of some needle-nose plyers on the old gas stove and squeeze the plastic ***** to narrow the end. Gently pry the reflectors loose. On some of the units, the center reflector is ALUMINIUM! You'll have to shop around to find taillight units that have the steel center reflector for re-chroming. Use a Dremmel cutoff tool to grind off MOST of the plastic tabs that hold the reflectors, leaving just enough to position the newly re-chromed reflectors. Buy a pack of nickel-plated thumb tacks. Using a heated paper-clip, burn a hole in the center of each tab. Position each reflector (one at a time) and push the thumbtack through the hole until the head contacts the reflector. Use a drop of super-glue on the pointy side of each thumb tack when finished. You can do the same with the front parker lights. For the dash bulbs (all of the interior lights) SuperBrightLED's has a selection of colored LED's that will fit (2 sizes in the gauge pod), bulb for the interior light, etc. (Use the correct color LED determined by the lens color). For the interior light, I used blue through the clear lens for "mood" lighting. I also added s couple of LED's to that circuit to light up the floor while the door is open and for the '80+ you can change the color of the "key" light bulb in the steering column cover to something more pleasing than white. For the side markers, buy a couple of yellow (for the '81+ also a couple of red) license-plate lighted bolts from SuperBrightLED's. Drill a 3/16's (or a 1/4" I forget) hole in the back of the sloped portion of the light socket. Position the hole so the bulb does not extend into the lens when installed (this is not a problem in the '81+ as the lens sets a little higher). 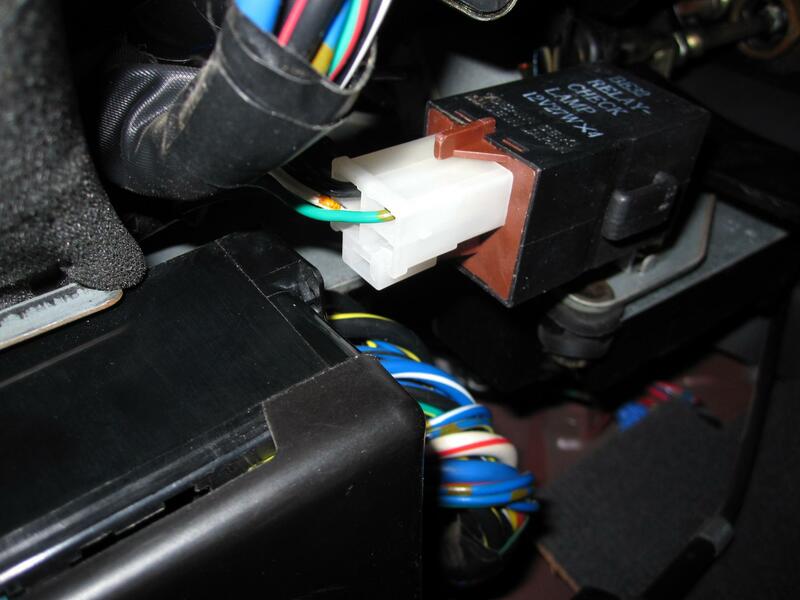 Hook up the red wire to the turn-signal circuit and ground the black wire. This information is specifically for the 85, but probably applies to 84 as well. It may be applicable for earlier years but I don't know that for certain. This past weekend I did a bad thing on my 85 GSL-EV and that was to hook up the 12volt battery backwards. It turned out that in my case with the stuff that is left in the car that the oscillator (looks like a relay on the drivers side of the car next to the radiator and the CPU under the dash were damaged by this. I was able to fix the CPU but just discarded the oscillator since I wasn't using it in the EV anyway. When I had the CPU out of the car and on my bench I decided to look at fixing the rapid flash issue you get when you replace the turn signals with LED's. As it turns out this is probably a simple change of a couple of parts on the CPU board but as the schematic in the FSM does not list the components it isn't quite that easy. There is no flasher module on the 84 and 85, it is integrated with the CPU module. I wasn't going to spend a day reverse engineering that portion of the CPU so for now the turn signals will need a load resistor. 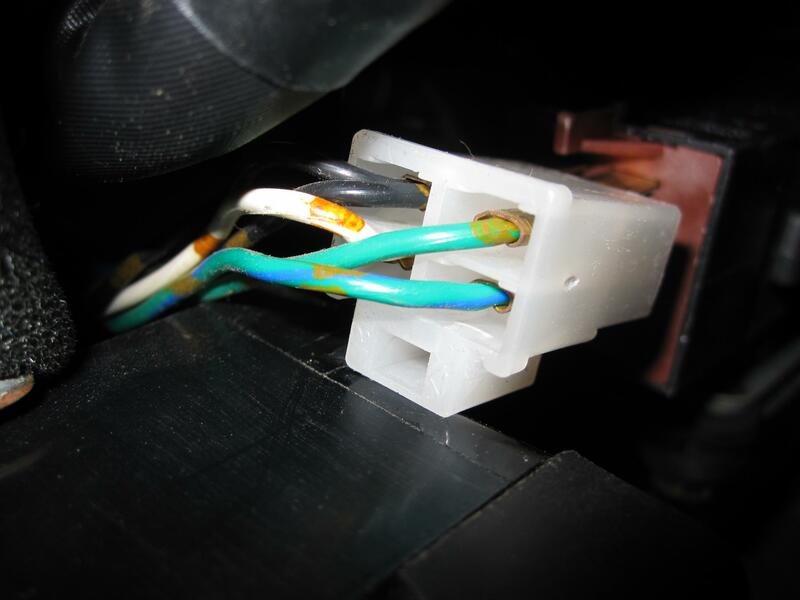 However you can easily disable the STOP LAMP indicator by pulling the blue with green stripe wire out of the connector that goes to the Lamp check relay. This relay is mounted on the other side of the CPU mounting plate just behind the fuse block. The connector is easily accessible and all you have to do is pop that wire out of the connector and then tape it to the cable. I suppose you could just cut it but then it would be harder to put back to original if you wanted that for some reason. I used a jewelers screwdriver pushed in from the wire side to release the connector from the housing. I wish I had taken a photo of this. I believe that the Lamp test will still work with this modification, it just wont nag you about burned out brake lamps anymore when you use LED's in that position. I will try this at some point on my GSL-SE when I get three more bulbs for it and report at that time. any update dougingraham? I have had the parts & pieces to swap to clear tails, just haven't made it that far due to cold start issues. I assume you were asking about disabling the check lamp relay for the stop lights and the answer is not yet. I almost got to this over the weekend. I am driving with the STOP LAMP indicator coming on every time I step on the brake. The PO had an alarm system installed and to get at the check lamp relay I need to remove the last piece of it. Real Soon Now I will get this done. I know it works to pull the wire as I mentioned previously. The only thing I dont know for certain is that the STOP LAMP indicator test will still work which would be a fail in some places for an inspection. It looks like it will work based on the schematics. Finally got to verify on my GSL-SE that pulling the green wire with blue stripe out of the check relay will prevent the STOP LAMP indicator from coming on but still allows the start up lamp test to work. So if you live in a place with inspections that checks that the warning lamps all work you can still use LED Brake Lamps and pass the inspection. (Unless they pull one to verify the sensor works.) I did consider the idea of opening up the check relay module and adjusting it for the current of four LED bulbs but there is little point as these bulbs should last 30000 hours. That would be 1 million 800 thousand miles at 60 miles per hour and that would require you to ride the brake pedal the whole time. The photos show the check relay which is under the dash on the back side of the so called CPU. I just pried the contact out of the housing with a jewelers screwdriver and taped it off to the wire harness out of the way. This is fabulous information! Thank you for taking the time to document this for the rest of us. Help! Might I have a bad ECU?